Romantic places in Tacoma, Washington abound, despite the fact that this industrial port city is often viewed as gritty or smelly. The fact is that Tacoma is not as gritty as it’s made out to be and that it has a beautiful waterfront, beaches perfect for watching the sunset or sunrise, romantic restaurants, and even some stores to check out if you want to spice up your evening with your significant other — and not just for Valentine’s Day. Whether you’re out for a date for the first time or trying to think up something to do with your spouse of 30 years, you don’t necessarily need to make the drive to Seattle to find romantic restaurants or sights. 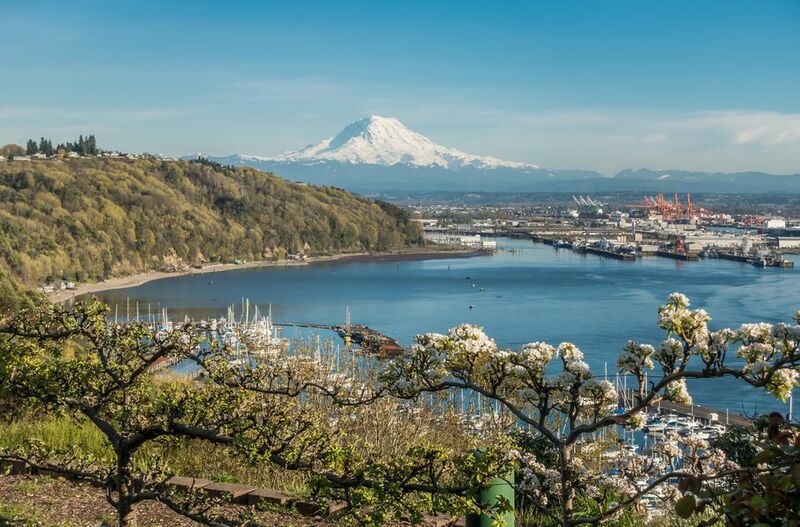 In fact, back in 2011, Yelp named Tacoma as the most romantic city in the U.S. and here are just a few of the reasons why this might just be true. Romantic things to do in Tacoma range from outdoor activities to theater shows to fine dining. If you want to get out and about, the Tacoma Waterfront is an especially romantic place to take a stroll. For morning people, this is also a great place to watch the sunrise — as long as it’s not a cloudy day. Due to the city’s geography, Tacoma has other areas along the water to consider as well. While you might not be able to kick off your shoes and walk in the sand at Tacoma’s beaches (most of the beaches are rocky here), there are plenty of beaches to explore. Owen Beach in Point Defiance also has a long walkway much like the Waterfront, and Titlow Beach to the west has a smaller sidewalk as well as nature trails nearby. Titlow Beach is a great place to snuggle up and watch the sunset and there is also a small casual restaurant located here. There are many other things to do in Tacoma as well. For art buffs, Tacoma Art Museum and the Museum of Glass are perhaps the perfect romantic places to spend an afternoon and are great as part of a self-guided walking tour. If getting out for a walk is not your idea of romance, Tacoma’s theater and restaurants may be better avenues to pursue. Downtown Tacoma has three theaters located near 9th and Broadway — the Pantages, the Rialto, and Theater on the Square. There are parking lots nearby as well as a number of restaurants that make ideal pairings with a show. These include El Gaucho, The Melting Pot, Pacific Grill, as well as the many more casual restaurants along 6th Ave.​ Downtown and 6th Ave. are both the best places to find upscale restaurants, but checking into areas like the Proctor District yields smaller, more intimate restaurant choices. Of course, dining on the water is one of the best ways to bring out the romance between you and your date of choice. The Tacoma Waterfront has a number of restaurants with water views and outdoor dining (on warm days). Courtyard by Marriott: 1515 Commerce St.
Chinaberry Hill Bed and Breakfast: 302 N. Tacoma Ave.
Of course, maybe what you have in mind for a romantic evening has nothing to do with leaving the house. The Tacoma area has several stores strictly for couples over 18. These include Castle Megastore at 6015 Tacoma Mall Boulevard, the largest of them all, and the place to find everything from bachelor and bachelorette party favors and games to toys and lotions ideal for couples to raunchier fare. The smaller Lover’s at 7002 Tacoma Mall Blvd. is also close by and has a smaller selection than Castle, but is perhaps more approachable due to its smaller size.